One day after picking up her sons from school, Ali decided to do something different: take a detour onto her favorite tree-lined street dotted with storybook homes. Ali spotted a For Sale sign in front of a gracious Colonial with perfect symmetry, wide shutters, and a flat yard that would be ideal for a ball game. Without hesitation, she toured the property that evening and, next morning, came back with her husband Jeremy. They both felt "that" instant connection. After purchasing the house, Ali and Jeremy asked me to help create beautiful and serene interiors that would also be friendly and relaxed. I learned that this was actually their first home, but they were not in a rush to furnish it. 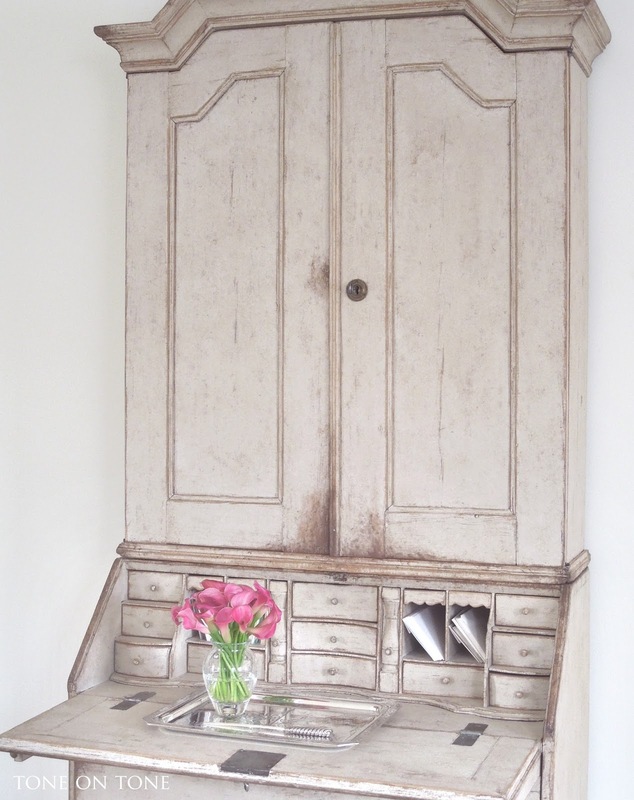 Instead, they wanted to approach decorating in an organic way; find the right pieces and gradually add layers. That was music to my ears as I believe in loving everything you have. I'm thrilled to share photos of this design project plus tips on mixing old and new, light and dark, as well as different styles and periods. A very special thanks to Ali and Jeremy for inviting us into their lovely home. 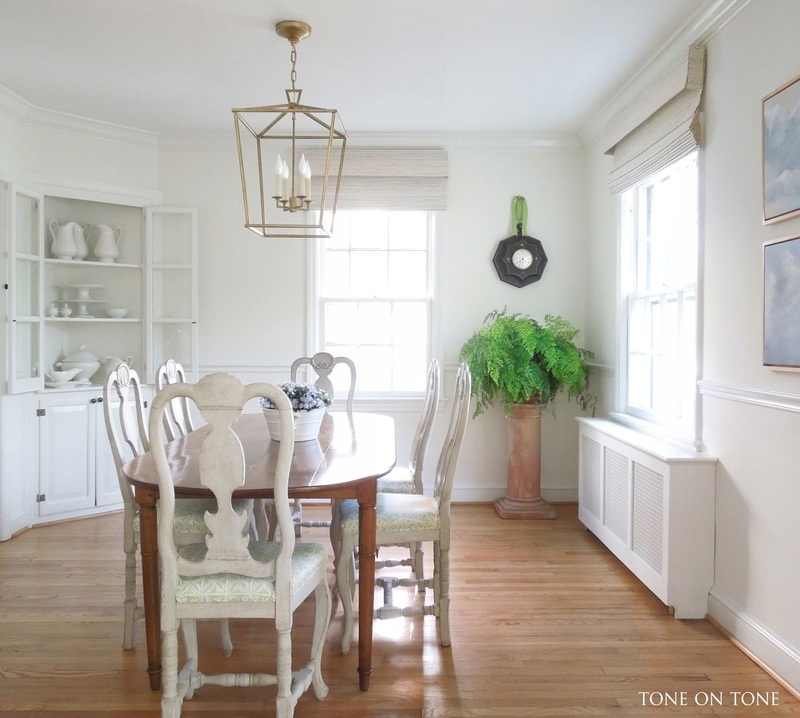 Located in the original part of the home, the dining room is the smallest room on the main floor. But it has an airiness thanks to the light walls and bare floors, which are a breeze to clean up after meals. Around an antique French farm table, which Ali and Jeremy found at my shop years ago for their former apartment, I grouped a set of antique Swedish painted chairs. Yes, it's okay to mix French with Swedish, and dark wood with painted surfaces. 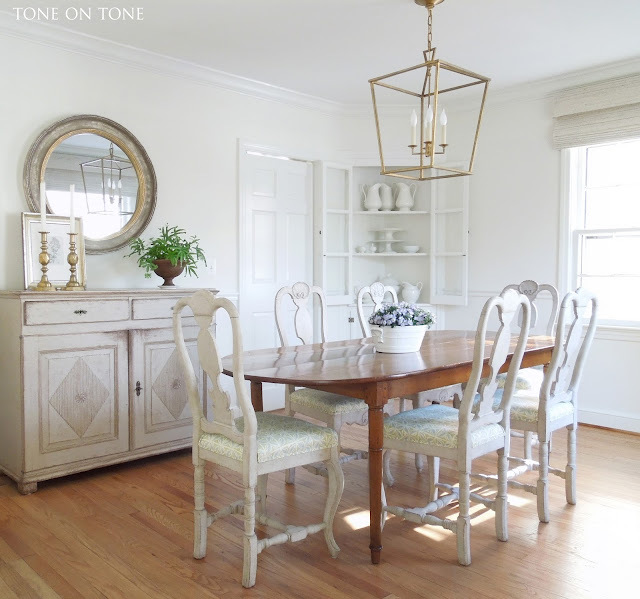 A collected-over-time look with furnishings that do not match is much more interesting! Let's chat function. For the chairs, I chose unupholstered backrests so that my clients would not have to worry about little finger prints staining fabrics on the backs. What about the seats? Well, those have all been Scotchgarded. To keep the look current, I hung a modern lantern from Circa. 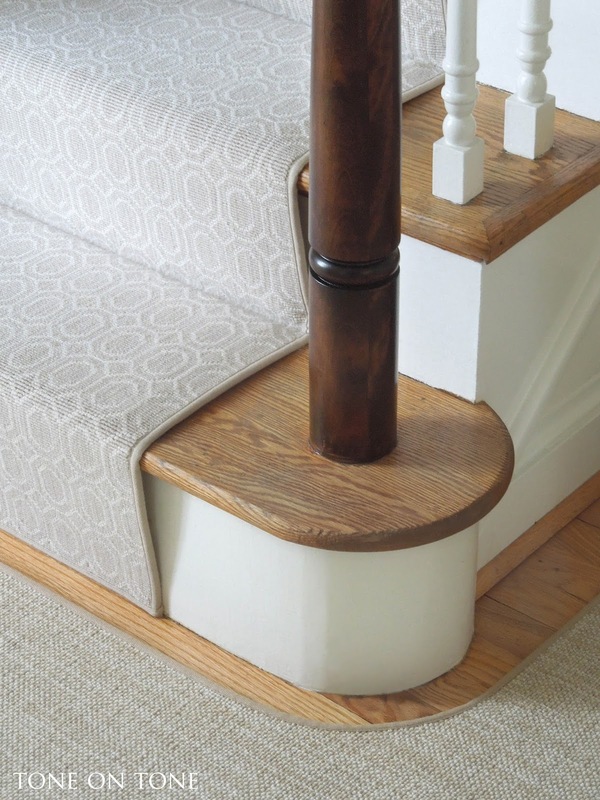 I especially appreciate its open design in this small space. 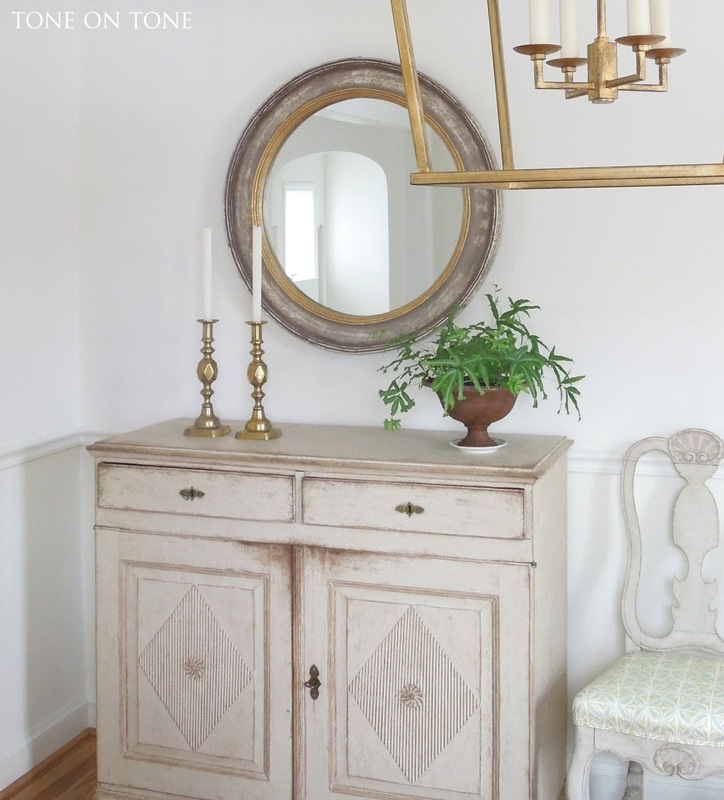 Over the antique Swedish Gustavian sideboard is a round mirror from Ballard. Yes, Ballard, the catalog company! Don't these two pair up wonderfully together? Good design is available at every price point. Because this is an older house, there are radiators under many windows. In lieu of curtains that wouldn't draw properly with the radiators, I chose custom woven shades in a fabulous tone-on-tone color. I ordered extra length and had them installed high up to give the illusion of taller windows. Also, when the shade is up we do not lose any light as the stack sits above the glass panes. The shades finish the windows in a casual yet tailored way. I love their texture! Now a look at art and accessories. A pair of contemporary cloud paintings continue the calm atmosphere while introducing color. For a little more pop, I tucked in verdant houseplants such as the Maidenhair and Variegated Club Foot Ferns, which also add life as well as texture. 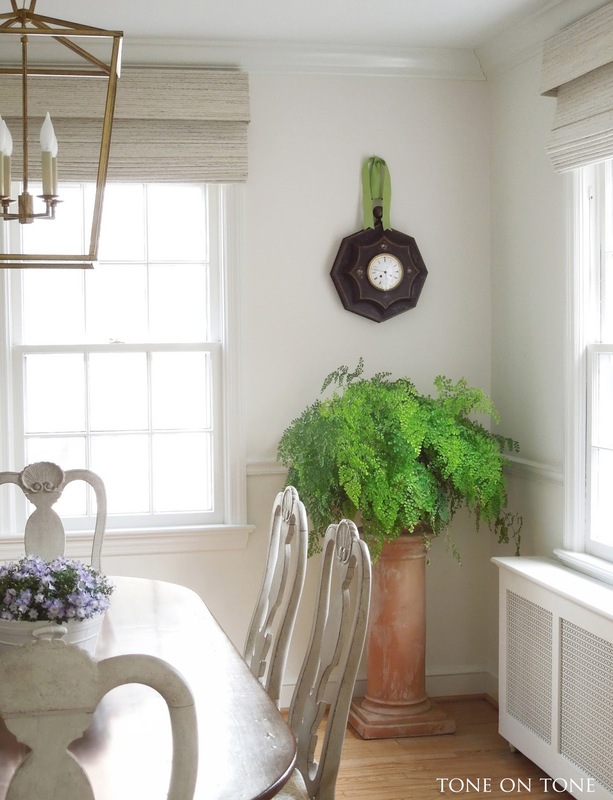 The dark wall clock contrasts with the collection of white ironstone china, keeping the palette from being too pale. Please come into Ali and Jeremy's living room. Each time I visit, I like to steal a few moments to sit here - it's my favorite! This was probably the most challenging to decorate. Though generous in proportion, there are six doorways / openings that lead here, so every piece of furniture had to be thoughtfully placed with traffic in mind. To unify the furnishings, I had an oversized area rug custom made for this lengthy space - note the jogs around the fireplace hearth and staircase. The rug is a forgiving wool with a crisscross striation that gives it depth. All the rugs have been Scotchgarded. 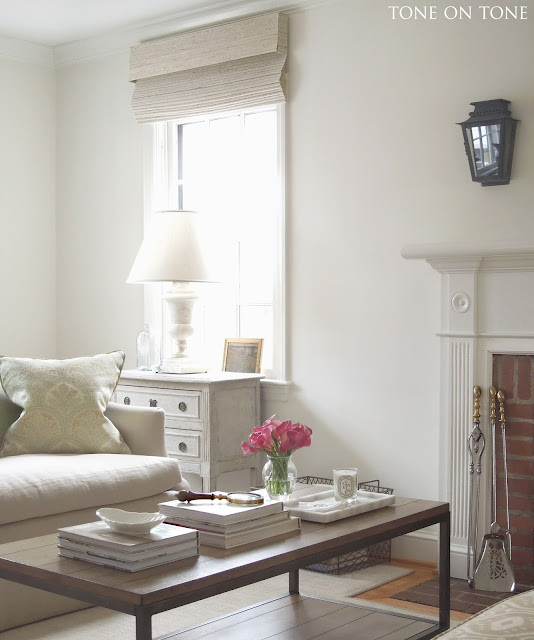 Speaking of fireplace, I intentionally left the brick surround and hearth natural - painting those white would have made this focal point flat. Plus, the old brick has such character. Over the fireplace is a French Impressionist painting from the 1930-40s, about the same period that this house was built. 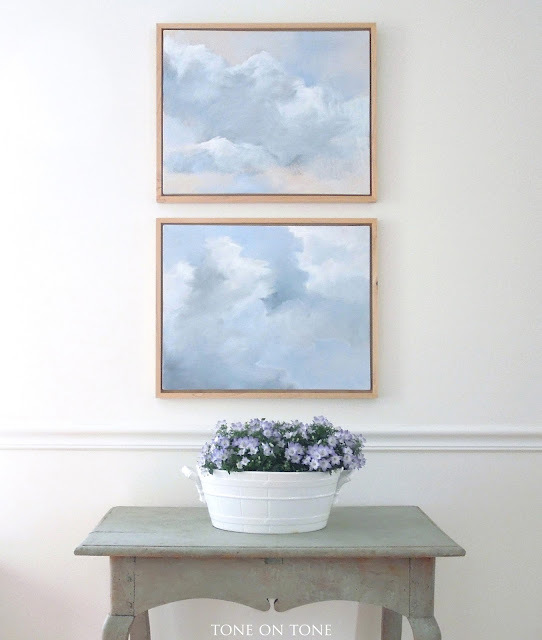 Flanking the painting are outdoor lanterns in an aged zinc finish. I wanted the room to have a garden spirit. A zinc jardiniere planted with trailing ivy is another gesture to the garden. 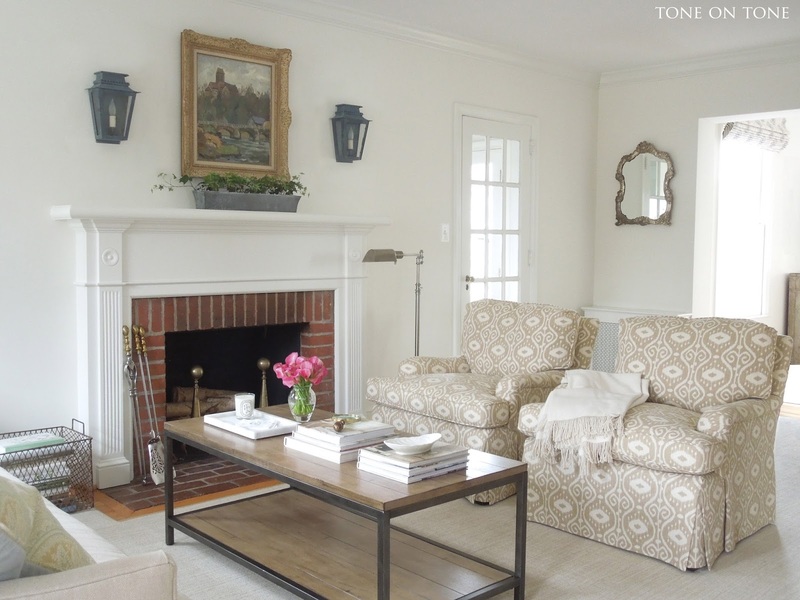 Serene and sophisticated is how I would describe this inviting living space. The tailored seating features updated, clean lines. Because there are no curtains, I skirted the sofa and club chairs to further soften the room. By the way, there are more seating plus wall accessories coming. Greens, blues and a hint of black accent the neutral palette. All the walls are painted the same shade of white for visual flow. 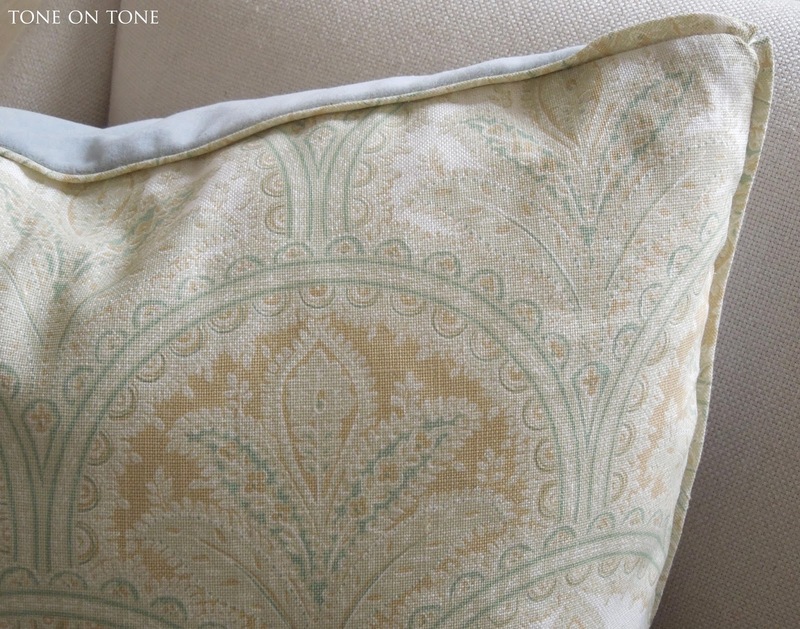 For the pillows, color inspiration came from the French landscape painting. Note the velvet backside and narrow flange with tiny corner pleats. Many thanks to my workroom for executing these details so exquisitely! The green Mora clock and secretary desk, both from my shop, are Swedish from the 18th century. They add height while lifting the eye up. The coffee table is from Ballard. I may specialize in one-of-a-kind pieces, but that doesn't mean I don't shop the box stores or retail chains. I hope you've enjoyed Ali and Jeremy's beautiful home. They have been such a pleasure to work with. Many, thanks to them! I look forward to sharing their family room and expansive master bedroom, both located in the addition of the house. There is more color as well as pattern in the casual family room - stay tuned. 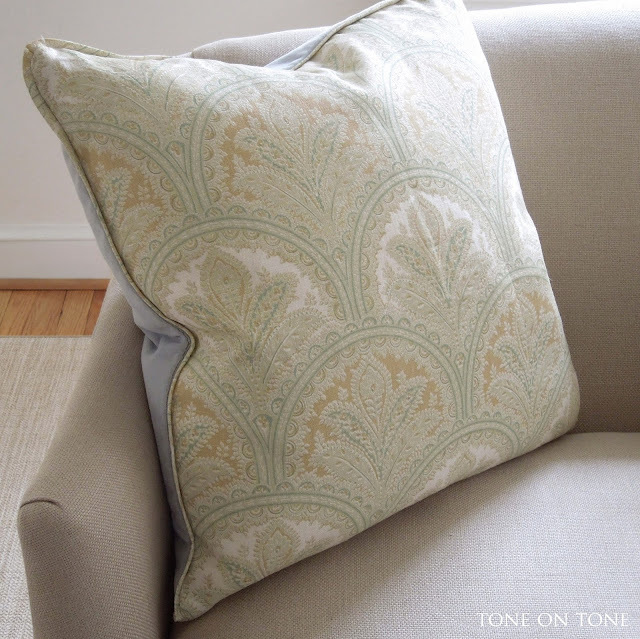 If you are interested in design services, please email me at info@tone-on-tone.com. I'd love to chat with you about your home!